This project was comprised of a series of one-hour listening focused on exploring the inner city suburb of Brunswick and its surrounds. Presented by the Australian Forum for Acoustic Ecology and Avantwhatever in conjunction with Naturestrip, this series of walks Saw myself, Polly Stanton, Ben Byrne, Prithvi Varatharajan, and Anthony lead a unique soundwalk throughout the area at different times of the day, each Sunday throughout the Month of Octobre, 2017. 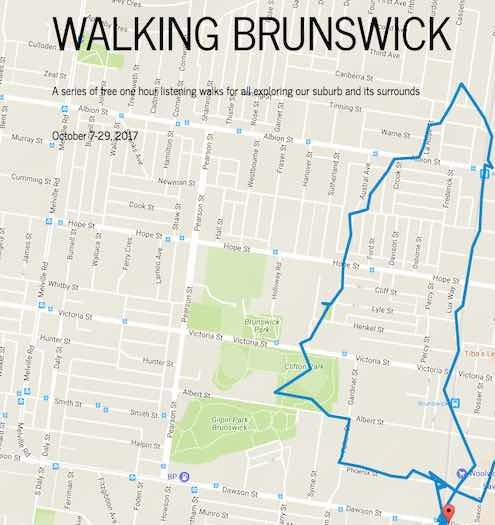 For my contribution to this project, I organised a 'silent' listening/recording expedition that began at dusk opposite the Brunswick Baths and traversed the upfield train-line, the back alleyways of suburban Brunswick and the industrial precinct of the suburb. Halfway through the walk, participants were asked to observe and perform 10 minutes of group silence in a stationary position, whilst I set about recording the activity.